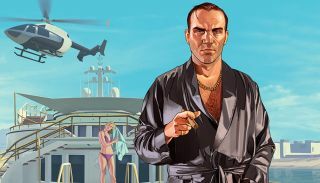 GTA Online will grow a little more next week with the launch of Executives and Other Criminals, an update that adds new opportunities to indulge in ultra-lux lifestyles, including new customizable apartments, stilt houses in the Vinewood Hills, and a fully-staffed Super Yacht. The good life doesn't come cheap, of course, so Executives and Other Criminals will enable you to create your own illegal organization and use it to access new co-op Jobs, challenges, and special abilities. You'll also be able to hire other players to work on your team of bodyguards, and fire them when they get out of line. Players who sign up to work for VIPs will earn a regular paycheque, plus RP (reputation), GTA$, and stat boosts. This being Grand Theft Auto, criminal orgs can go head-to-head in Freemode, and some existing Freemode events, including King of the Castle and Moving Target, will automatically adapt when being played by organizations. There will also be a new Adversary mode called Extraction, in which a team of Bodyguards must locate and rescue an Executive from a downed jet before a Hit Squad shows up and does its dirty work. GTA Online: Executives and Other Criminals will go live on December 15.